Cleaners are the neglected workers that most of us take for granted. They often begin their shift before or after most of us, but their job is vital to a healthy workplace and in some settings, critical to preventing the spread of infection. 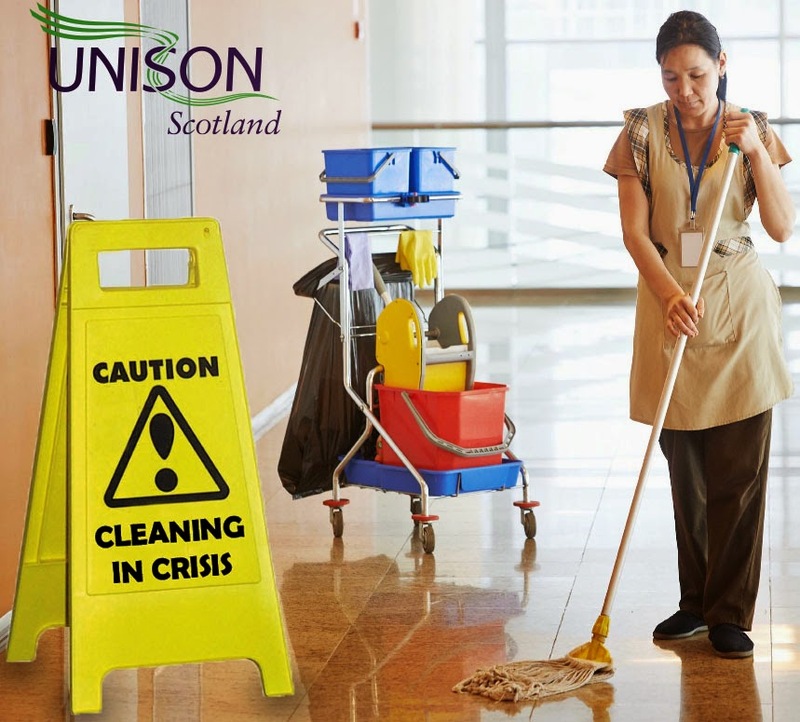 UNISON Scotland has been surveying cleaning staff in areas where we organise to get a picture of how they are faring in the era of cuts and austerity. The report we published, 'Dishing the Dirt' paints a picture of a workforce largely, but far from exclusively, female, mostly part time, and trying simultaneously to deal with an increase workload and wages that don’t go as far as they used to. A particular concern is that nearly one in five cleaners had been in a pensions scheme, but had opted because they couldn’t afford the contributions. This will lead to greater inequality in the long term and higher levels of pensioner poverty. This survey should be a wake up call for employers who are ignoring their hidden workforce. Everyone should be concerned about the impact on hygiene and infection control. Cleaners matter – not just because they have as much right to dignity and respect in the workforce as any manager or Chief Executive. But because the work they do is vital in every respect. This should be recognised, by both ensuring that they are given the environment to do their job properly but also in recognising its value where it is most obvious – in their pay packets. Cleaners are Worth It. The Food Standards Agency (FSA) hasn't had the best of press recently, now they have forced their staff out on strike and refused to resolve the dispute at ACAS. There has been growing concern over the way the FSA handles food safety across the UK. It's part of the reason why Scotland is in the process of establishing a separate body, although many of the problems are likely to remain here as well. A recent survey for the Food Standards Agency showed 59% of raw chicken bought at supermarkets contained the potentially deadly bacteria Campylobacter. As an article in the Scotsman put it, "After a decade of trying to get the poultry industry to clean up its act, the Food Standards Agency had promised to name and shame the worst offenders in the first quarter of its year-long survey. However, pressure from the industry has led the FSA to back down". Few lessons also appear to have been learned from the horsemeat scandal. The Guardian discovered that the publication of the inquiry into the scandal has been blocked amid government concerns that the public would be frightened by the idea that criminals were still able to interfere with their food. UNISON members in the FSA will be taking strike action on 26th and 27th August. For the second year in a row, the FSA imposed a pay rise of 0.75% on our members, while most other public sector workers have been offered a 1% increase. Even as late as last week, UNISON asked them to reconsider and go to ACAS for arbitration, but they refused. 1100 instances of parasitic lung worm in cattle, from entering the food chain. We all know from hard experience in many sectors that light touch regulation doesn't work. It's a message that hasn't yet been understood by the UK and Scottish government's. Independent chicken inspections have already been diluted and the Scottish Government has recently done the same for pigs. Meat inspectors, official veterinarians and support staff cost each person in the country just 38 pence per year. A small price to pay for safer food. 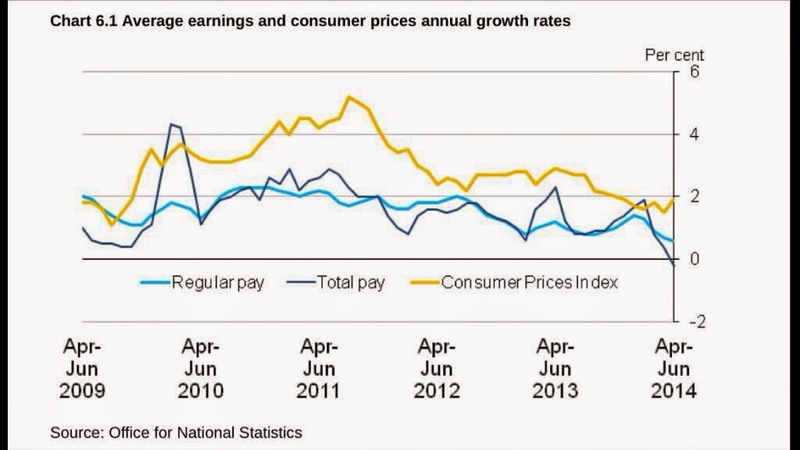 To add insult to injury they are being offered pay rises below even the miserly government pay policy. Staff in slaughterhouses work in some of the most dirty, difficult and stressful conditions, surrounded by blood and faeces, to keep the public safe from contaminated meat. They deserve a fair pay rise. Delivering health and care integration is proving every bit as a complex as we anticipated. I was at a seminar in Ayrshire today that brought together our council, health and community sector activists to discuss the implementation of the health and care integration plans in the Public Bodies (Joint Bodies) Act. Ayrshire has three Shadow Integration Boards but are planning to adopt a pragmatic local approach by sharing lead roles and manage some services on a pan-Ayrshire basis. None the less it will be a complex matrix structure, on top of what is already a complex array of services. More clarity is needed on how the new organisations work with NHS, councils and partners in the third sector. Wherever you draw boundaries there will always be a need to work in a connected way with other services outwith the new structures. Front line social workers in Ayrshire very clearly highlighted the problems the private sector in particular is having in delivering the home care hours they have been contracted to deliver. In my overview, I drew attention to international evidence of what works in care integration. It's a long list on the slide, but the common feature is that it's about people. Sadly, in this whole process that's the bit that has been given the least attention. Most workforce issues have not been resolved, like different procedures; disciplinary, grievance etc. Different salaries and conditions also apply for workers doing similar jobs. There is a national group working on these issues but it is making very slow progress. There are also different industrial relations models and cultures. However, the positive news is that there is a willingness to adopt a positive best practice and employee reps on the integration boards will help that. There is a risk that as we focus on the mechanisms of integration boards, we lose focus on the wider changes that are impacting on this sector. Issues like self directed support and budget cuts are happening at the same time. There are also different views on the role of third and private sector in service delivery and different approaches between councils in Ayrshire. Some understand ethical care issues better than others and procurement strategy is an important issue for everyone involved. There is also demographic change with growing numbers of older people. How this is addressed is not consistent across Scotland. 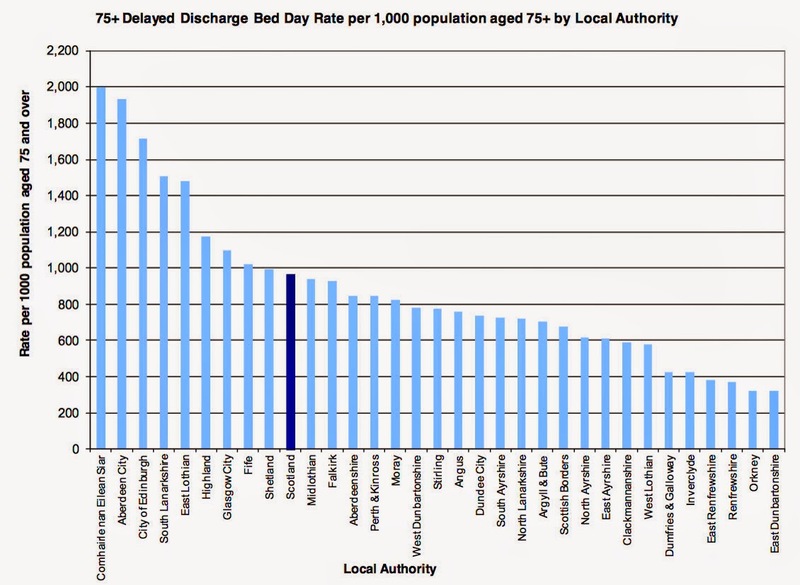 The common picture is the reduction in residential care beds and increasing demand for more intensive home care. 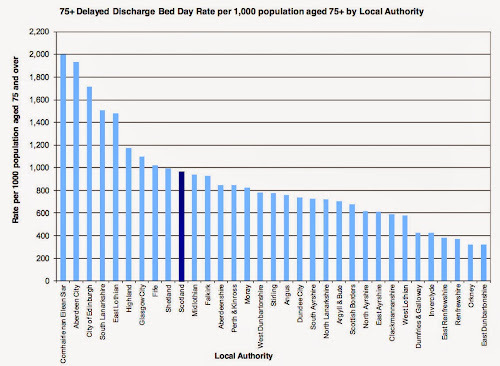 However, there are very different patterns of unscheduled admissions to hospitals, and delayed discharges. That is a big cost that was always intended to fund social care. I remain sceptical that much of this revenue cost will actually be released. Integrating and connecting services remains a desirable objective. However, the challenges colleagues flagged up in Ayrshire today are reflected across Scotland. Structures are of course important, but it's people that deliver quality care services. Fifty years of centralisation hasn't solved Scotland's biggest challenges, so let's try strengthening local democracy. That's the conclusion of the final report of the Commission on Strengthening Local Democracy. It argues that the level of inequality remains intolerable after years of centralisation and has left us with huge social and financial costs. They also identify a link between the absence of strong local democracy and the prevalence of inequalities. It is communities that empower governments at all levels, not governments that empower people. The report starts by making the case for local democracy. Put simply, they argue that strong local democracy means putting local people in charge of their own lives, and leaving national government to focus on outcomes for the whole of Scotland. They do recognise the countervailing forces of centralisation - consistency, efficiency and public support. As others have put it, one person's postcode lottery reflects another's local circumstances. The Commission has identified seven principles that they believe provide a powerful basis for renewing Scottish democracy. They have also concluded that the evolution of Scotland’s democratic system across the past 50 years has more or less undermined or inverted all these principles, albeit often with good intentions. It's recommendations start with the need for a fundamental review of the structure, boundaries, functions and democratic arrangements for all local governance in Scotland. They recognise that calling for another review might appear a bit inadequate, but it requires a bottom up engagement on a scale that is outwith the scope of this Commission. They do however point to different approaches in different parts of Scotland, in particular, between cities and more rural areas - no one size fits all solutions here. They strongly oppose the 'supersizing' of councils and suggest that 60 to 80 councils might be the way forward. This would bring Scotland more in line with the rest of Europe. It should also consider bringing the array of services currently delivered by national quangos under local democratic control, through a 'right to challenge' national delivery. This would also enable councils to connect services more effectively. Where this isn't practical, councils should have the power to veto the local plans of national bodies. Unsurprisingly, they identify the lack of local fiscal powers as the biggest limitation on local democracy. They recommend that local government should have full local control of the whole suite of property taxes and a general competence to set and raise new taxes, subject only to not duplicating taxes already set elsewhere. This chimes with the Scottish Parliament's call for a cross party approach to council finance and UNISON's own approach. Another interesting recommendation is making Ministers undertake ‘subsidiarity impact assessments’ on national policy and legislation, as a way of restraining the drift to centralisation. This is balanced by a duty on councils to support and resource community participation in all local decision making about tax, spend and service delivery priorities. This means deliberative engagement, not just more consultation. As they say, language is important here. The report captures this as the choice between ‘ceding’ power and ‘seeding’ power. In other words it is about subsidiarity, not decentralisation. The report also discusses how the role and powers of local government could be embedded in the constitution, as is the norm elsewhere in Europe. 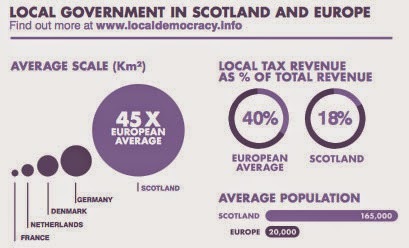 In particular, the European Charter of Local Self Government should be put on a statutory basis within Scotland. While the Commission's recommendations will take some time to deliver, they helpfully suggest ways in which we could start the journey now. Community planning, decentralisation schemes and other local initiatives offer a way forward to embed a different approach to developing local democracy. The powers already exist to do much of this. However, we need to take the opportunities of additional devolution or independence to ensure that we don't simply swap Holyrood for Westminster. Scotland is few people's definition of local. In conclusion, the report argues that communities across Europe have enjoyed the benefits of strong local democracy for decades. Scotland must be no different. Real change can create a vibrant new democracy for this century and a stronger, more equal society. I would argue that there is much in this report that will be welcomed by those who support genuine local democracy. It gets the balance right between recognising that democracy doesn't end in the council chamber and the rather woolly community development approach that risks capture by unrepresentative interest groups. I suspect many will find the lack of firm recommendations in key areas like structure and finance frustrating. However, there is a direction of travel on these issues that is consistent with some well thought through principles. What stands out from the report is the clear articulation of the case for local democracy. It is welcome for that alone. Women, especially those on low pay, are firmly shut out of the economic recovery. That’s the conclusion of a new report - The changing labour market 2: women, low pay and gender equality in the emerging recovery’, published by the Fawcett Society. Since the start of the crisis in 2008, almost a million (826,000) extra women have moved into types of work that are typically low paid and insecure. Since 2008, female under-employment has nearly doubled (to 789,000) and an additional 371,000 women have moved into self-employment, which is typically very low paid. 1 in 8 low paid women now describe themselves as on a zero hours contract. The increasing levels of women in low paid work, along with the declining value of low pay, is contributing to the widening inequality gap between women and men. Last year the gender pay gap increased for the first time in five years and now stands at 19.1 per cent for all employees. This report is published on the same day as the Prime Minister announces that all government policies must pass the ‘family test’. You might therefore expect some action on the issues highlighted in the Fawcett Society report. You will be disappointed. The initiative focuses on age ratings for music videos and a throwing a few pennies at the counselling service Relate. Not a mention of the impact of welfare cuts on the family, the closure of sure start centres or the consequences of his austerity economics. The Fawcett Society report sets out the harsh reality of a Britain the Prime Minister simply doesn’t understand. The 'Working Together' Review has set out a positive new framework for industrial relations in Scotland. Last February the Scottish Government commissioned an independent review of progressive workplace policies and practices in the public and private sectors in Scotland. It was Chaired by Jim Mather and had a broad based membership from employers, trade unions (including UNISON's Lilian Macer) and academics. The aim was to identify best practice to promote collective bargaining and innovation in the workplace. In many ways the strength of this report is in the description of industrial relations in Scotland today. It dispels many of the myths about relations between unions and employers, highlighting the positive relationships that rarely get media coverage. Scotland does of course benefit from significantly higher union density than the rest of the UK, but this report goes further in setting out the range and depth of industrial relations practice. This is helpfully illustrated with case studies and examples from a range of sectors. a willingness to resource, evidence, share and learn from what works. There are 30 recommendations in the report that seek to deliver practical actions in support of the key themes. They recommend that there should be a new strategic stakeholder body to provide leadership and support the development of better industrial relations. The model is to be promoted through procurement and the other policy levers of government. Practical measures that I particularly welcome, include recognition of the valuable role equality and green union representatives can play in the workplace. A number of UNISON projects have shown the value of these and the proposed environmental workplace fund would aid the development of green reps.
For the public sector there is a recognition of the merits of the NHS partnership model and the benefits of a degree of common best practice. This reflects the Christie recommendations and UNISON's case for a national workforce strategy. Extending worker directors to all public bodies is also welcome and the Scottish Government has an opportunity to deliver on this in the Food (Scotland) Bill. The basic premise behind these recommendations is that the economic and social challenges and opportunities facing Scotland are more likely to be addressed successfully in an environment where unions play their full part. Those in trade unions who cling to the Marxist school of industrial relations, or the 'race to the bottom' employers, won't find a lot in this report to encourage their approach. However, most employers and trade unions in Scotland will welcome this report and look to the Scottish Government to translate their response to the recommendations into action. There are still some very mixed messages on the economy in the latest batch of reports. Scotland's economy continued to strengthen over the first half of the year, with a forecast to of the strongest year of growth since 2007, according to the Scottish Government's latest State of the Economy report. Output expanded by 1% in the first quarter of 2014, moving beyond pre-recession levels, and business surveys indicate that expansion has continued in the second quarter of the year. The latest retail sales figures for Scotland increased in the second quarter but at a slower pace than Great Britain as a whole. Data indicated that sales volume grew by 0.8% between April and June and on an annual basis, they were up by 2.9%. In comparison, retail sales in Great Britain increased by 1.6% during the second quarter, and by 4.5% annually. However, the National Institute for Economic and Social Research (NIESR) said Britain is growing at its slowest pace in a year, following news that the manufacturing sector is performing less strongly than the City expected. NIESR believed the economy expanded by 0.6% in the three months to July, down from 0.8% in the three months to June. Their estimates come after ONS released figures showing manufacturing lagging well behind the service sector in its ability to recoup ground lost during the "great recession" of 2008-09. The ONS said that output from UK factories remained more than 7% below its pre-recession peak. The strong pound is also a concern for exporters. Increasing growth is also having little impact on wages. The FT highlights that very few have increased the starting salaries they offer, denting hopes for a recovery in wages after six lean years. Just 2% of the 1,000 employers surveyed by the Chartered Institute of Personnel and Development reported a significant increase in starting salaries. The organisation’s survey of 1,000 employees showed the median pay rise this year was just 2 per cent, down from 2.5 per cent in 2013. The summer Labour Market Outlook (LMO) report also warns that wage growth is expected to remain weak, even though output is growing strongly and the jobs market is buoyant. Further evidence comes from today's ONS Labour Market statistics. Unemployment in Scotland has fallen by nearly 1% in the last quarter with significantly bigger reductions for women than men. Irritatingly, there is again no Scottish wage data, but UK data shows that average wages excluding bonuses rose by 0.6% in the year to June, the slowest rise since records began in 2001. 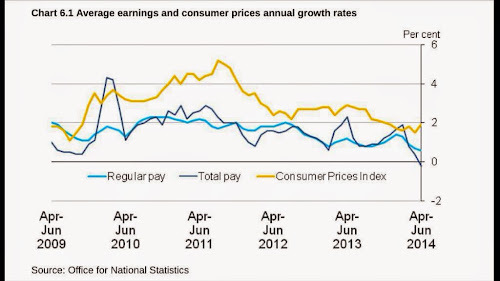 Low average wage rises are an indication of the level of so-called "spare capacity" in the economy. This is the Bank of England's measure of the extent to which the UK economy is underperforming, as a result of a lack of business investment either in hiring new staff, technology or machinery. It is also an important factor in their advice on the timing of any interest rate rise. There is some, albeit outdated, evidence that the wages of full time workers are rising faster than average wages. This might indicate a further shift to part time work. Francis O'Grady at the TUC sums this up well, "The combination of rising employment and falling pay growth suggests the economy is very good at creating low-paid jobs, but struggling to create the better-paid work we need for a fair and sustainable recovery. Self-employment has been responsible for almost half of the rise in employment over the last year. The fact that self-employed workers generally earn less than employees means our pay crisis is even deeper than previously thought, as their pay is not recorded in official figures. Falling unemployment is always welcome – particularly for young people who are finally starting to find work – but unless the quality of job creation increases Britain’s living standards crisis will continue and people will be locked out of the benefits of recovery." Overall, it does appear that the economy is recovering slowly. However, better employment numbers still reflects insecure and part-time working. Most importantly, wages are not increasing and that is an essential element of sustainable economic growth. A recent survey for the Food Standards Agency showed 59% of raw chicken bought at supermarkets contained the potentially deadly bacteria Campylobacter, with 16% being heavily contaminated. This demonstrates, yet again, that the light touch regulation favoured by the UK and Scottish government's is not protecting the consumer. Campylobacter is the most common form of food poisoning in the UK, affecting more than a quarter of a million people every year. It causes stomach upsets, vomiting and diarrhoea and is responsible for more than 100 deaths a year, costing the economy £900m. Stephen Jardine highlights the regulatory failure in his Scotsman article, "After a decade of trying to get the poultry industry to clean up its act, the Food Standards Agency had promised to name and shame the worst offenders in the first quarter of its year-long survey. However, pressure from the industry has led the FSA to back down". He concludes "Action will only come when culprits are named and shamed, forcing them to act tough with suppliers to protect their market share. Then, and only then, will things really start to change." Even that bastion of the free market, The Daily Mail, was outraged, "The survey results are a damning indictment of supermarkets, farmers and processors who are putting customers at risk every day of the week"
Food safety experts have highlighted the close links between the industry and regulators. Erik Millstone, professor of science policy at the University of Sussex said, "The FSA has failed to keep its promise to the British public. This means that consumers can no longer trust the FSA to put the interest of consumers ahead of those of the food industry." In June this year, I gave evidence to the Scottish Parliament's Health Committee on the Food (Scotland) Bill that will create Food Standards Scotland. I highlighted the work of Scottish meat inspectors in preventing over a million instances of diseased animal carcasses from entering the food chain. The FoI data we released included 100,000 chicken tumours. I said, "This shows what a vital job meat inspectors do. We are calling on the Scottish Government to ensure that Food Standards Scotland is focussed on safety of consumers not food industry profits. Meat inspectors and vets must be able to carry out thorough independent inspections, free from food industry influence." Meat inspectors and environmental health staff have been warning of the implications of deregulation and cuts in food safety for years. To add to the demoralisation caused by unheeded warnings, meat inspectors are now suffering real term cuts to their pay. They are not even getting the miserly government pay policy. Meat inspectors, official veterinarians and support staff employed by the Food Standards Agency have therefore voted for industrial action. That action will have a serious impact on food output. The food industry hasn't done enough to clean up its act and deregulation has simply encouraged them to put profits before consumer safety. The FSA has been complicit in this process, being far too close to the industry. The Scottish Government has an opportunity through the establishment of Food Standards Scotland to take a new approach. Early signs are not good with the Scottish Parliament passing regulations that allow visual only inspection of pigs. Hopefully, this latest survey will cause ministers to think again and put the consumer first. Forget pension fund managers and their expensive fees - pop down to the casino. Even some of the best fund manager financial track records are simply performing at the market average you could achieve by random chance. This is the entertaining and important hypothesis argued by Toby Ord from the University of Oxford in today’s edition of the academic newspaper ‘The Conversation’. Important because most of the £24bn of our Scottish local government members pension cash is invested in equities, advised by fund managers. And they don’t come cheap. Last year there was an excellent Radio 4 programme, "How You Pay for the City" that highlighted excessive charges in the UK compared to Holland that means the average comparable Dutch pension will be 50% higher than you would get in the UK. The programme set out the mechanisms fund managers use to maximise their fees at the expense of scheme members and pensioners. It is not just excessive fees by fund managers, but also "churn" (excessive buying and selling of stock); stock lending (they lend out your share certificates for a fee), "Custody Banks" and "transitional management". In Scotland’s biggest pension funds, local government, we are moving towards a new system of governance that should provide an opportunity for greater transparency and engagement by members. These are the sort of issues that the new pension board members will need to grapple with. Cities could play an important role in our energy system. In the energy chapter of the 'Red Paper on Scotland', I argued for greater public ownership of energy generation in Scotland by rediscovering the role local government used to play. This reflects what other countries regard as the norm, notably through the growth of renewables in Denmark. Local government led the way in the 19th Century by generating energy. It's time to rediscover that role and the IPPR report shows how to do it. Three years ago the Christie Commission reported on ‘The Future Delivery of Public Services’. It was a landmark report that set the direction for reform in Scotland and some core ideas have spread into wider UK thinking on the subject. I wrote an article in last Friday’s Scotsman that reviewed progress with some of the Commission’s key recommendations. It was a mixed scorecard, with centralisation and insufficient focus on the workforce being the main delivery problems. Government legislation all too often largely ignores the workforce component of service delivery, giving the impression that services are delivered by robots. There is no workforce strategy that creates a framework to stop everyone reinventing the wheel in every service change. The Christie "one public service worker" concept is nowhere to be seen. A number of Christie concepts can be seen in an interesting IPPR paper, "Many to many: How the relational state will transform public services". While the analysis focuses on English public service reform, the analysis is very similar to Christie. The authors argue that top down delivery might be appropriate for transactional services, like bin collection. However, other more complex problems require a relational engagement between staff and service users - one that provides continuity and a deeper relationship. Care, early years and maternity services are good examples of this. They also require a cross cutting response from teams drawn from different delivery partners, breaking down the service silos. This was also a key recommendation in the Christie report. This table explains the differences between transactional and relational services. While I largely agree with the point they make about relational services, I would disagree that transactional services are best provided with limited differentiation. Christie highlighted the work of systems thinking that show that bottom up design works here as well, albeit in a different way to relational services. Public service users are not always the well connected citizens they might be. As ever, solutions are more difficult, particularly at time of service cuts. The authors argue for two big reform moves which they call ‘connect’ and ‘deepen’. First, at the system level, the relational state means managing public services as interconnected systems. This means a decentralisation of budgets to local authorities and city-regions. There should be greater pooling of funding, so that services can take a ‘whole person’ or ‘whole area’ view using integrated multi-disciplinary teams. These teams would get greater frontline autonomy with systems that encourage them to share knowledge and learn from innovation. Second, at the individual and community level, the relational state means deep relationships instead of shallow transactions. This means linking service users with lead professionals with whom they can develop a relationship over time, such as the same care worker in their home. Professionals would be allocated to neighbourhood-based patches with a single point of contact for users. On the collective level, institutions would be designed in ways that strengthen relationships between citizens and enable them to tackle shared problems together. The paper gives many examples of where this approach has been adopted in practice. There are parts of the solution, such as the use of league tables, that don’t appear consistent with the overall approach. However, much of this analysis would be familiar to the Christie Commissioners who travelled Scotland to look at similar best practice. Finally, the paper looks at the political challenges, persuading politicians at the centre to ‘let go’. There is also the cost of building these deeper relationships, although the paper shows how this can be more cost effective in similar ways to the preventative spending concept championed in the Christie report. There is also the challenge of engendering greater civic participation, creating the space for people to help themselves, or co-production in Christie terms. Three years after the Christie report it is interesting to see others reach similar conclusions. The IPPR report has clearly been influential in Ed Miliband’s thinking around public services. Scotland starts from a different place, but there is much common ground on the best way forward.